Well never fear as today Diamond experts De Beers are on hand to help advise on the best ways to clean your ring and keep it looking beautiful. Why Do Diamonds Lose Their Shine? Everyone knows that your best diamond is the one which sparkles the most, but does everyone know how to keep it sparkling all day and all night? A diamond rapidly loses its brilliance when it becomes opaque through contact with substances such as moisturising lotions, and eventually becomes dirty when skin particles and dust adhere and accumulate behind the diamond. This will not wash off with water because diamonds have a very high affinity for grease. Oils and greases are hydrocarbons which tend to stick well to surfaces that do not contain oxygen. A diamond surface, therefore, which is pure carbon, is ideal. The most effective way to clean a diamond is to take it to De Beers or your local jeweller and have it professionally cleaned and polished. It is a free service for life if you have bought your ring from De Beers. Sometimes you may feel embarrassed by the dirt that builds up on your diamond ring, especially in the case of diamond earrings, and you may prefer to clean your jewellery at home. Over the years a number of methods have been used in the homes which are alternatives to buying pots of liquid jewellery cleaner. For example, a solution of washing up liquid in warm water can often be effective as long as it is well rinsed and brushed gently with your Ex’s toothbrush 😉 also soaking your ring or studs in alcohol, such as gin or vodka can work well. Once you have cleaned the whole ring how do you keep it from becoming dull in a few days? De Beers diamond expert Andrew Coxon has recently invented something completely new for your diamonds, for those ‘diamond emergency’ moments, he has developed little 5x5cm single use diamond and alcohol sachets, Diamond Polishing Cloths, which fit snugly in every handbag. Never a dull moment! Each sachet contains over 1 million tiny diamond polishing particles which are six times finer than particles in wisps of smoke, so they polish, but never scratch, your diamonds in seconds. From opaque to brilliant in less that ten seconds and no need to rinse either because the alcohol evaporates so quickly. A box of fifty De Beers Diamond Polishing Cloths can be ordered online or from any De Beers store worldwide. They are exclusive to De Beers and have been called ‘the little big thing for diamonds’ because they work! If you wish to test them just pop into De Beers Jewellery store and ask to try one out for free. The stunning engagement ring in our header image is from the Enchanted Lotus collection by De Beers, you can see more engagement rings here on Rock My Wedding. 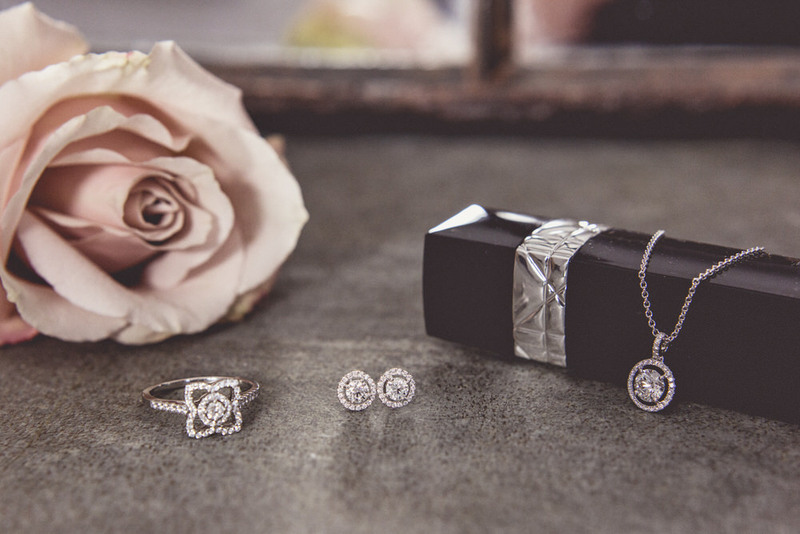 The earrings and pendant are from the beautiful Aura collection, which you can see more of on the De Beers website. A fantastic guide to picking the perfect diamond engagement ring!